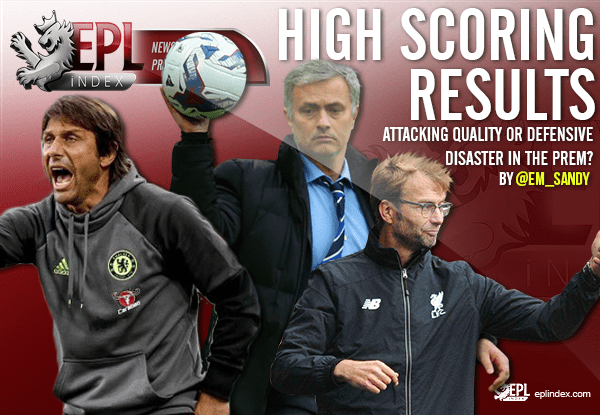 EPL Index > Arsenal (NN) > Attacking quality or defensive disaster in the Premier League? The 2016-17 season is in full flow and already it’s thrown up some astonishing results. Arsenal’s 3-0 victory against Chelsea last weekend was unpredictable, whilst Liverpool’s impressive start to the campaign continued with an emphatic 5-1 hammering of Hull City. Even Manchester United fans wouldn’t have expected to beat the defending champions 4-1 and it was the eleventh time this season a Premier League team scored four or more goals past an opponent. The opening weekend alone saw 28 goals scored throughout the top flight and there was some serious attacking talent on display. The arrival of Zlatan Ibrahimovic to the Premier League has naturally brought some more quality to England but there’s already a host of names for fans to marvel over. Diego Costa has led the way so far, scoring five and assisting one in Chelsea’s opening six fixtures. Sergio Aguero has scored as many but the surprise package of all is Michail Antonio, who’s already netted five times for West Ham United, despite a slow start for his team in their new stadium. There’s been goals galore so far this season, with a total of 174 already hitting the back of the net. Surely this means the Premier League is boasting some of the best attacking talent around? Sure, there’s been some blistering performances. Manchester United’s starting XI is one that most club’s around the world would be envious of and Liverpool’s attacking intent under Jurgen Klopp has proven fearless and entertaining thus far. However, is it attacking quality or defensive troubles that have seen high scoring results in the Premier League so far.? It’s likely a bit of both. However, the lack of defensive stability across the league is worrying. It’s been a while since the top flight boasted some of the world’s best defenders and last season’s most impressive unit, Tottenham, seem to be struggling slightly too. Toby Alderweireld and Jan Vertonghen were arguably the best centre-back pairing throughout the 2015-16 season and though their quality is still evident, they’ve not looked as solid so far this season. Kyle Walker and Danny Rose both had their best seasons last year but it’ll be a tough task to emulate the highs of their title-chase campaign. Each of the league’s top teams have defensive worries. Liverpool’s back four is still of major concern, with James Milner filling in at left-back due to the poor performances of Alberto Moreno. Chelsea’s Gary Cahill and David Luiz have both made fairly unconvincing starts to the season and John Terry has already faced time on the sidelines due to injury. Manchester City boss Pep Guardiola ruthlessly allowed England’s number one to leave and as Joe Hart left, Claudio Bravo came in only to produce a few nervy moments during the Manchester derby. City’s defence has yet to really be tested though, as they’ve gotten off to an emphatic start to the season. Jose Mourinho’s United squad are still undergoing some big changes and whilst Eric Bailly has improved the defensive back four, Chris Smalling’s injury and Paul Pogba’s slow start to life in the Premier League have hampered what had the potential to be an exciting start for United fans. Arsenal’s defence looks as weak as any and West Ham have had an awful start to the campaign, despite impressing largely last season. All-in-all, it’s not been the best of starts for the Premier League’s defences. Whilst defenders have faltered, attackers have shone and there seems to be a correlation between the two. It’s exciting for supporters but the high-scoring results aren’t as well appreciated when you’re on the losing end of it. Whilst the attacking performances cannot be underestimated, it must be concerning for the league’s top managers to see their side conceding so many goals. In European competition, it may not be so easy to penetrate defences in the way they have done so freely in the Premier League. Categories: Arsenal (NN), Burnley (NN), Chelsea (NN), Crystal Palace (NN), EPL Index Featured Article, EPL Index Opinion, Everton (NN), Hull City (NN), Leicester City (N), Liverpool (NN), Manchester City (NN), Manchester Utd (NN), Southampton (NN), Stoke City (NN), Sunderland (NN), Swansea City (NN), Tottenham Hotspur (NN), Watford (NN), West Bromwich Albion (NN), and West Ham United (NN).' 'Tags: "Manchester United", Aguero, Arsenal, Chelsea, danny rose, David Luiz, Diego Costa, Hull City, Ibrahimovic, James Milner, Liverpool, Man Utd, Milner, Moreno, Pep Guardiola, premier league, Sergio Aguero, Vertonghen, and Zlatan Ibrahimovic.